Women worldwide have been dying their hair for centuries with a variety of natural and chemical products. In fact, it is estimated that over one-third of women over the age of 18 use some type of hair dye as part of their basic beauty regimen. The act of dying your hair is completely normal, but using hair dye during pregnancy can bring some questions to the chemical structure of the dyes. You want to be certain that everything that you do to your body is not going to have a negative impact on your developing fetus. The use of permanent, semi-permanent and temporary dyes has been found to have no negative impact on pregnant women or their fetuses. There are about 5,000 chemicals used in hair dye, some of which are thought to be toxic or carcinogenic. Therefore, it was very important for scientists to determine, through rigorous studies, whether the chemicals in hair dye could be harmful to women and their pregnancies—an issue that never emerged. 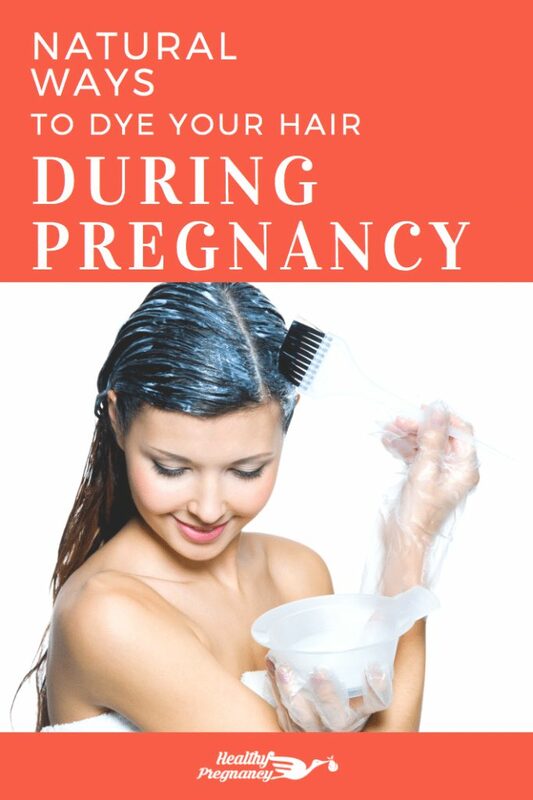 In addition, only small amounts of hair dye become absorbed by the skin of the scalp, leaving very little that would reach the fetus through absorption into the bloodstream. Brand-name hair dyes have been through extensive trials and quality control processes to ensure that they are safe to use and it is in their best interest to make sure they stay that way, as otherwise huge lawsuits could ensue. If you want to avoid the use of toxic chemicals altogether, henna (also traditionally known as Mehendi) is an age-old method to dye hair. It has been around since the time of the ancient Egyptians and ancient Indians, who regularly dyed their hair various shades of red, brown, and amber, using a paste made from the henna plant. Using henna to dye your hair during pregnancy is perfectly acceptable. It is an all-natural dye and contains no harsh chemicals. It is also considered to be good for your hair—improving its quality, shine, and texture—an important factor to consider when hair quality may be impacted by hormones. It does, however, take much longer to prepare—you have to let it sit for at least four hours, or even better, overnight. Henna is also a great choice for creating a rich auburn color on dark hair or brighter shades of red to blonde hair. Using a strong black tea hair rinse can be a natural way to darken most medium hair colors. In addition, to darken your hair a bit, use black walnut hull powder steeped in hot water, which can be used as a dark hair dye. Keep in mind, the more powder you use the darker the color will be. This will dye anything that it touches, so be careful if you start lathering it up. If you’re looking to lighten your hair color up naturally, spraying or pouring fresh lemon juice over your hair and letting it air dry in the sun can help lighten up the color. Additional natural remedies for lightening hair color are by adding chamomile, calendula, or rhubarb root tea to your hair, which can add a honey tone to darker blonde. Both can be used often for a cumulative lightening effect. You may want to have that ginger look, but that ingredient won’t help you get the natural red color in your hair. Instead try soaking your hair for about 30 minutes with tomato juice, which acts like a dye. Additional options for a red hue include hibiscus flower and calendula flowers mixed in a tea which can add red tones to hair. For a more purple hue of red, try using beets or beet root powder. If you still have concerns or are hesitant in any way, highlights remain a good option. Since highlights are only applied to certain strands of hair, there is no (or very little) direct contact of dye on skin. Highlights also tend to contain less oxidative chemicals, which can contain more volatile chemical compounds. Another option is pure vegetable dyes like henna (as mentioned above). Some physicians recommend waiting until at least your second or third trimester to dye your hair, as it may lessen the chance of some negative reaction. Until now, no study has shown any negative effects on the unborn child. Another thing to consider is the mental benefit that is gained from going to the salon or otherwise taking care of your appearance. Not neglecting to take care of yourself during pregnancy can increase the risk for post-partum depression. Treating yourself and going to the hair salon once or twice in those nine months is a great way to give your body a natural boost of endorphins—and that is always good for both you and your baby. Once you make the decision between the bottle or breastfeeding, finding the perfect nursing bra is both a practical and important decision. When purchasing a nursing bra, there are a few things to consider, and finding the perfect style of nursing bra that fit you post pregnancy is essential. Is Consuming Salt and Caffeine During Pregnancy Dangerous? Previous Post: « The Dangers of Baby Monitors: Parents Take Note!